Synopsis: In 1988, renegade filmmaker Robert Altman and Pulitzer Prize-winning Doonesbury cartoonist Garry Trudeau created a presidential candidate, ran him alongside the other hopefuls during the primary season, and presented their media campaign as a cross between a soap opera and TV news. 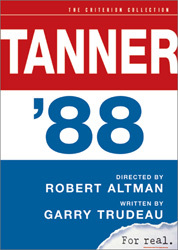 The result was the groundbreaking Tanner ’88, a piercing satire of media-age American politics, in which actors Michael Murphy (as contender Jack Tanner) and Cynthia Nixon (as his daughter) rub elbows on the campaign trail with real-life political players Jesse Jackson, Gary Hart, Bob Dole, Ralph Nader, Kitty Dukakis, and Gloria Steinem, among many others. eyelights: the mish-mashing of fact and fiction. the cameos. Honestly, ‘Tanner ’88’ would never have registered on my radar if I hadn’t, a few years ago, decided to explore Robert Altman’s oeuvre – or, at least, what works of his that I had within reach. I had already seen most of his ’90s films, as well as ‘MASH’, ‘Nashville’, ‘Popeye’, and ‘3 Women’, and they were all terrific aside from ‘Popeye’ (although the ‘The Gingerbread Man’ was rather underwhelming). I particularly enjoyed the multi-faceted casts and interweaving storylines that he’d became known for. ‘3 Women’, however, promised something exquisitely different from the auteur and I hoped to find more where that came from. So I delved deeper. I picked up a Robert Altman DVD collection featuring some of his less stellar works, grabbed what I could get from the library and explored as much as I could. But I couldn’t find ‘Tanner ’88’. I knew very little about it, aside from the fact that it was a television series, and then found out that it was only available through The Criterion Collection, which is usually a good gauge for quality filmmaking. It wasn’t available anywhere in my area, however, and it took a few years before I could get my hands on it. With the 2012 election coming up, I ramped up efforts to get ‘Tanner ’88’. I figured that if ever there was a perfect time for an election-related mockumentary, this would be it. And since it’s all about timing (even blurbing! ), I decided that it was now or never. Well, maybe not “never” – but it would be at least four more years. ‘Tanner ’88’ turned out to be quite the enjoyable series. It was conceived by Robert Altman and Doonesbury cartoonist Garry Trudeau as a bird’s eye view look at the political shenanigans in an electoral campaign. They wanted to provide insight, to make people feel like they were privy to what goes on, as well as poke fun at the process. It did, however, give me a sense of being there. The series was shot in a behind-the-scenes documentary style, but it mixes this with a touch of soap opera. So, although there are moments that feel extremely real, others decidedly feel staged, more akin to a standard television show. Having said this, despite being unusual, it’s an interesting mix and it works. What’s fascinating about the project is that Altman and Trudeau had their amiable candidate, Jack Tanner (played with steady assurance by Michael Murphy), campaign side by side with other Democratic candidates. In so doing, they managed to mix him up with real-life events, such as demonstrations and rallies, as well as the actual 1988 Democratic National Convention. This means that the show is filled with cameos from actual political animals of all sorts, some of whom would gain greater prominence in years to come, such as Al Gore and Joe Biden. Again, not being fully familiar with the U.S. political landscape, I have no doubt that much was lost on me – but I nonetheless recognized many names, if not the faces. Political junkies, however, would no doubt lap up this who’s who. Episode 1: This double-length series opener takes us into the beginning of Tanner’s campaign, as he mixes it up with real politicians, such as Bob Dole and Gary Hart. Also central to the show is the focus group of volunteers who are assessing the Tanner campaign’s first ad. The show closes on a rousing speech by Tanner, one that is so heartfelt and inspiring that it would make me vote for him. And yet, it was scripted – as are most speeches, admittedly. Episode 2: The Tanner campaign is gaining traction, thanks in part to the ads that were cobbled together after the first episode. It’s amazing to see just how many real politicians play along and endorse Tanner on this show. Absolutely amazing. Episode 3: This episode is a bit of a blur, aside from its ending, which would be dramatic in real life, but was meant to be humourous in the show. The key thing that I retained was Tanner’s line about the country once trying to be good, but now is only trying to feel good. I found that comment spot on and worth reflecting on. Episode 4: I really enjoyed how this one started, because it was at a soirée, where various pols mingled and talked about strategy, candidates, issues, philosophy, …etc. This one fell right into Altman’s key strength, which is showing people interacting in seemingly mundane ways, but nonetheless exchanging substantially. Episode 5: At the end of the last episode, Tanner was arrested at a protest rally. It was a bit forced, in my view, but Episode 5 follows-up on this incident to give us a look at the fallout from Jack’s arrest – will it hurt or help his candidacy? Only time -and the correct spin- will tell. Episode 6: Tanner finds himself schmoozing to get some fundraising money, as the campaign is having a hard time funding itself. He also hires a communication specialist to teach him the basics in speech-making, so that he can better connect with his audience. In so doing, we see him sell himself out a little bit, having been a more natural presence thus far. Episode 7: A debate between Michael Dukakis, Jesse Jackson and Jack Tanner makes the news because of Tanner’s unorthodox position on drugs. It was quite cool the way that they inserted Tanner in the debate, which presumably featured only Dukakis and Jackson in its original form. It’s not perfect, but Altman and Trudeau did a credible job of it. The episode closes with Tanner’s love-life being dragged out into the open. Episode 8: Following the previous episode, there is much fallout from Tanner’s love affair with Dukakis’ Campaign Manager (or is she the Communications Director?). Then there is a long segment surrounding his visit of Detroit, in which the candidate comes face to face with the issue of street crime and gun control. A rally for SOSAD sobers him up and alters his views on these issues. Episode 9: Tanner decides to marry his girlfriend now that they’ve been outed, even though they’re midway through the campaign. Again, Altman’s forté for small moments and exchanges really shines. One of the key sequences is the closing bit when Tanner announces his cabinet selections, including Ralph Nader and Gloria Steinem. There are a few nice surprises there, and the picks’ reactions are gold. Episode 10: Finally, Tanner makes it to the Democratic National Convention. It gets intense as his team tries valiantly to get people moving in support of Tanner. Again, it was spectacular to watch fact and fiction merge as they edited the convention footage to include Tanner in the proceedings. Episode 11: In the aftermath of the convention, Tanner decides what he should do: continue as an independent or give up? Altman and Trudeau wanted to extend the series at this point, but HBO wouldn’t finance it. So they ended it on a cliffhanger – which I find absolutely perfect. I especially liked how they closed the show with someone trying to confirm with Tanner that his run is over, and all we get is silence, and Tanner looking into the camera, reflecting on his options. Excellent. I would normally rate each episode individually, but I found them all to be equally good, in the areas of a 7.75-8.0. I had to rate the overall project higher because, as a whole, it’s quite the achievement. They had to script on the fly, depending on how the campaign unfolded, and yet they still managed to hammer out a cohesive, engaging whole. The 2-DVD set features new retrospective intros, which were filmed in 2004 (presumably at the time that the follow-up, ‘Tanner on Tanner’, was made), for each episode. It also includes a short, and mildly insightful dialogue between Altman and Trudeau, as they reminisce over the making of the series, giving viewers perspective on its creation and the intentions that fuelled the piece. ‘Tanner ’88’ is pretty much an “alternate reality” take on the U.S. Presidential election of 1988. For those who know their politics, this must be quite a treat, watching fiction mixing in with reality so effortlessly. For the rest of us, it’s an intriguing look at what takes place behind the scenes, at what moulds and makes the news. From both perspectives, it’s a hit, and I would whole-heartedly recommend it to diffuse any current election blues.